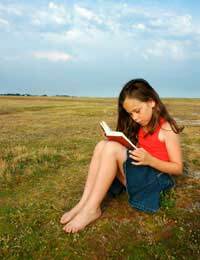 Encouraging your child to keep reading over the long summer months can sometimes seem like an insurmountable task. Luckily, there are programmes available that can take some of the burden off the parents. One is a summer library reading programme, which not only helps kids maintain their reading skills, but also fosters a love of libraries and books. What is a Summer Library Reading Programme? Reading programmes are usually open for children of any age and ability, whether they are just learning how to read, or are already confident readers who want to show off their literary skills. Most programmes give incentives to kids who complete reading either a specific number of books or pages. Sometimes, that must be accompanies by a book report. The goal of such programmes is to make reading fun, and to encourage children, through a variety of ways, to keep them interested in books long after the summer is over, and to develop a lifelong love of reading and learning. Invite children to storytelling sessions where adults read to the kids. Host special entertainment sessions for the children, often with clowns, magicians etc. Have visits from children's authors who talk to groups of kids about their work. Stage a big bash at the end of the summer for all the children who took part in the programme. Give out awards to children at the end who have completed the programme. Summer reading maintains what children have been taught throughout the school year. It helps them acquire a larger vocabulary, opens up their imaginations and invites them to experience new adventures. Reluctant readers will find help and encouragement, while confident readers will discover like-minded people who share their love of books. Reading in general also helps children to understand more of the world around them, and to become leaders. People who read are never lonely and always have something to talk about. Unlike people who rely primarily on the electronic media for news and interaction, those who regularly read books have better reasoning skills, are rarely bored, and are better able to put world events into an historical context and make better sense of things. With so many children today being so preoccupied with television and computer games, encouraging them to read more is more important than ever. Sometimes it seems as if the summer days can stretch on forever. And long holidays often mean that your bright little angels begin to forget all the lessons they learned over the academic year. If you want to avoid having your child return to school completely empty-headed, it's important to keep up with learning during the summer. That's where a library reading programmes make so much sense – and it can also make life that much easier for the parents! So visit your local library and sign your kids up – it's something you'll never regret.